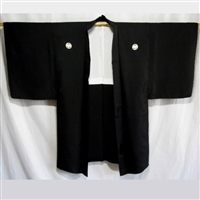 We specialize in traditional, vintage (1920-1980) Japanese garments: kimono (long robes), haori (short kimono jackets), obi (sashes/belts), and related wear for men, women and children. Most were custom-made, sewn by hand for their original owner, circa 1950-60. Sizes generally fit a small to medium sized person, but please check measurements. Women who prefer a roomier fit should check out our "one size fits most" Japanique Jackets, slightly modified from vintage michiyuki jackets. Larger men and women are rarely able to wear the vintage sizes but can consider our Custom Made options.